PlayDude is an independent London based brand run by designer and illustrator, Mike McCabe. It creates limited editions of toy figures, accessories and apparel with a loyal following of online fans. PlayDude often collaborates on projects with major brands like Vans shoes to create exhibitions, projects and accompanying projects. In July PlayDude hosted and event with London based skate company Blast Skates at House of Vans. As part of this event PlayDude created a limited edition figurine for attendees to purchase. They wanted these figures to look as close to a mass manufactured product as possible. This meant blister packing the finished figures. However, due to the number of figures they were intending to produce, packaging factories would not want to do the work and quotes they were receiving were prohibitively expensive. The challenge was to make a short run of factory level packaging on time, within budget and that would adhere to their high standards of products. By using the FormBox to create both the prototypes for the packaging and the final run, PlayDude were able to significantly reduce their lead times, costs and number of prototypes. 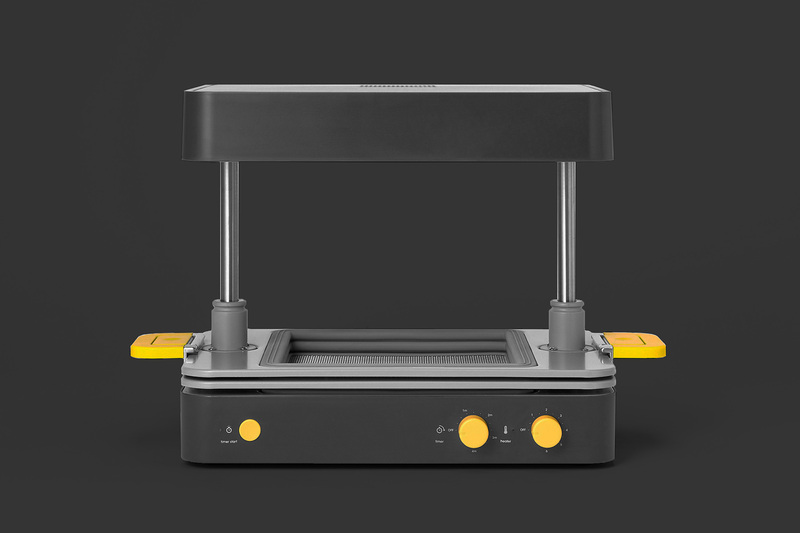 They implemented a 3D printer into the FormBox workflow, using an Ultimaker 3 to create a master pattern that could then be vacuum formed with the FormBox. This enabled them to quickly test for positioning, fit and removability. It also enabled PlayDude to get physical prototypes into their hands for inspection extremely quickly, rather than waiting for slow deliveries, massively reducing their product development time. After a few more iterations of 3D print + vacuum form cycle, they perfected the final form. A high definition master 3D print was created, the inner void of which was filled with Mayku pour, a pro-grade plaster that ships with the FormBox. The plaster, once set, makes for a solid core, enabling the 3D printed plastic part to be vacuum formed multiple times over in quick succession without deforming. This inexpensive and rapidly created tooling can be kept for re-use at a later date. PlayDude then set up a pop-up desktop production line in their studio and vacuum formed 50 factory grade packaging pieces. Once the pieces were formed, they were cut, the toys were placed snugly inside, all of the pieces were assembled into their final form and a short run of 50 products were made in less than a day. You can see the end result as part of this awesome video.